Remember that old Battlebots show? They brought it back this summer, and it was fantastic. Take a look on Youtube if you haven’t seen it. I’m on Team JACD (an abbreviation of the original members of the team: Jamison, Adam, Charles, and Dane – these guys are also part of the reason why I started this blog and these projects in the first place). 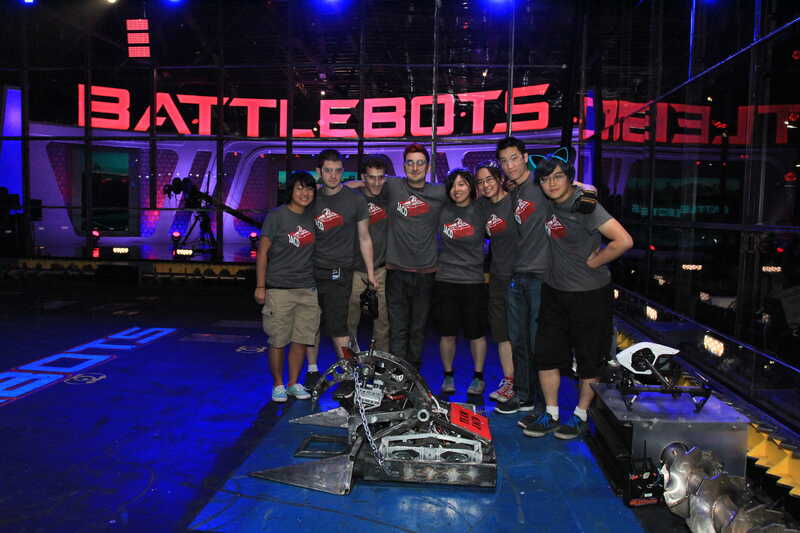 Having never been on a nationally broadcast TV show before, participating in Battlebots was quite the unique and fun experience. I feel so extraordinarily lucky to have been able to be a part of this with such an awesome team! 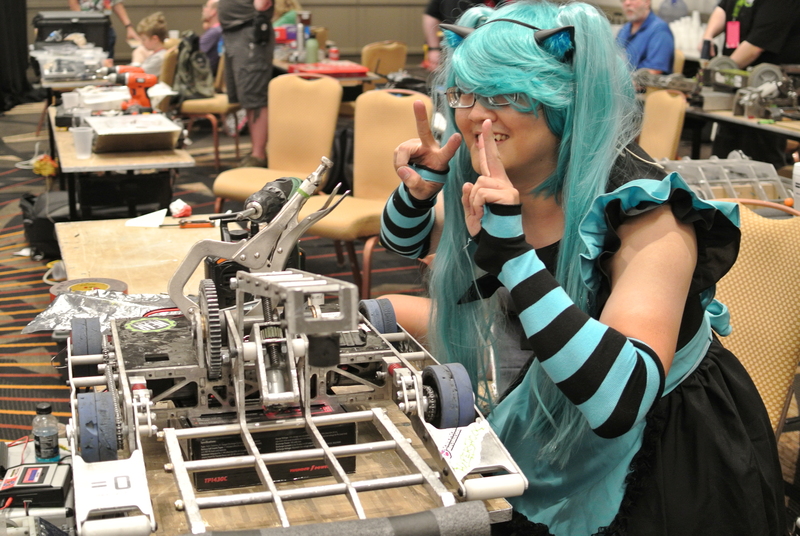 Building a 250lb Battlebot clearly wasn’t satisfying enough, so the girls from the team (Lucy, Cynthia, and I) made our own combat robot team – HaLuCy-nation (ha. get it?) and created the 30lb “sportsman” class Destroying Angel. Lucy also brought in her ridiculously cute and lethal DeathCap 3lb bot (you can read more about its awesomeness on her blog). Note the naming scheme: they’re both terribly poisonous mushrooms. I’ll be cramming the details of the design, build, and first event details into a single post, and hopefully, there will be more to follow. The awesome graphic on the back was designed by Cynthia Lu. The rules for these competitions vary depending on the event, but for the most part, they tend to be in agreement. In general, these competitions are like gladiatorial combat – two remotely controlled bots in the arena, and the match goes until the timer rings or one bot is disabled or destroyed. 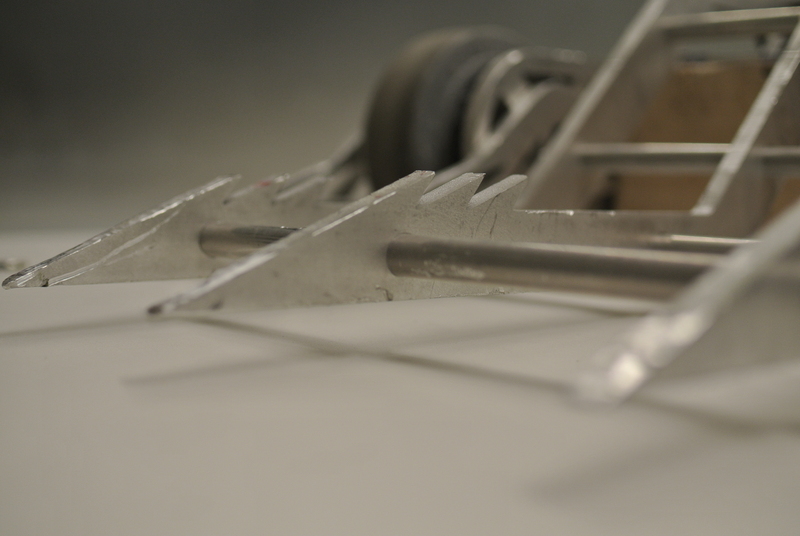 The bots are divided into weight classes (1lb, 3lb, 12lb, etc. ), and specific classes may have their own rules. For example, the 30lb “sportsman” class does not allow spinning weapons. After the initial sessions of scheming, it was decided that along with a typical 4WD boxy frame, we wanted Destroying Angel to be a lifter/flipper – inspired, of course, by bots such as Uberclocker Advance and MegatRON. 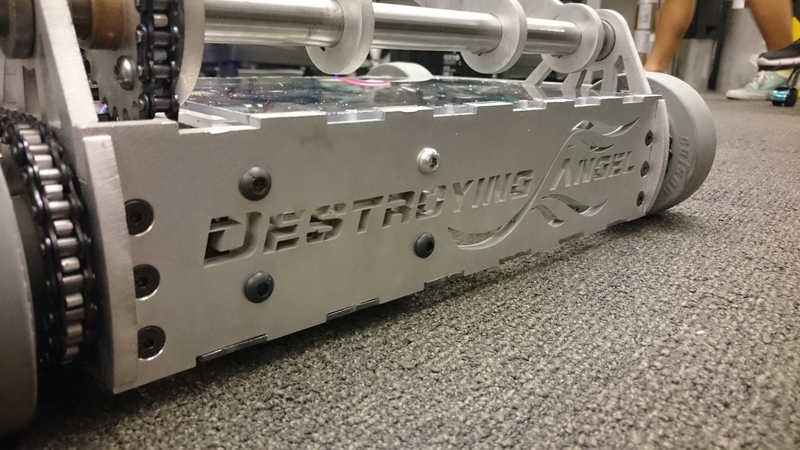 Thanks to the close proximity to Equals Zero Designs HQ, the drive uses RageBridge motor controllers and Dewuts as the motors chosen run both the drive and weapon. Taking advantage of parts we had on hand, we also used a Botbitz ESC to control the weapon itself. Powering it all is a Thunder Power RC Lithium Polymer 7S 4400mAh battery. The simple innards and haphazard cable-routing pictured above. #35 chain was used for both the drive and weapons. This was mainly because it’s a fairly standard chain size, and it’s also more forgiving in terms of misalignment and manufacturing errors. For calculating the details of actuation (mainly the gear ratios), we used the Tentacle Combat Robotics Torque/Amp-Hour Calculator. 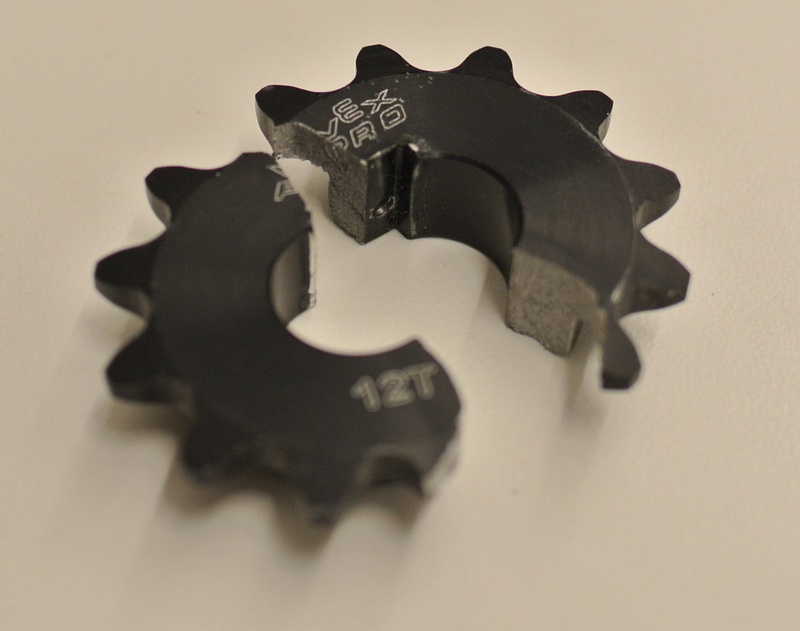 The wheels themselves were an assembly on their own- the dead steel shaft, the hex shaft around it, a printed nylon hex insert for the Colson wheel, the wheel itself, a plastic spacer (to keep the chain from rubbing), and a waterjet-cut sprocket, all pictured below. The print path for the nylon hex wheel inserts on the MarkForged printer software. The weapon went through several design iterations before the actual manufacturing happened. The initial design looked much like the final one (and a bit like the lifters on Overhaul and BiteForce), except that the initial version called for a polished aluminum dead shaft over which weapon would move. Amid concerns of uneven loading and imperfect alignment, the final version changed to having a fully keyed live steel shaft that would move with the entire assembly. Another thing that changed was that the initial version had waterjet aluminum rectangular bars traversing the main weapon frame. For ease of assembly and disassembly, the final version uses threaded steel rod that goes all the way through the weapon frame. Aluminum tubes are used as spacers for the weapon frame, and the rods/tubes are constrained using a Kep nut on one side of the steel rod and a nyloc on the other. The weapon was designed to have a relatively low profile while actuating from the back of the bot in order to make sure that we could self-right if flipped over. The barbs pointing backwards imitate arrowheads and snake teeth to hang on to anything that catches. Much like Uberclocker Advance, we chose to include front “legs” on the bot. Unlike Uberclocker, the legs do not have any sort of spring return, but they do have a hard stop to keep the frame from tipping when attempting to lift an opponent. 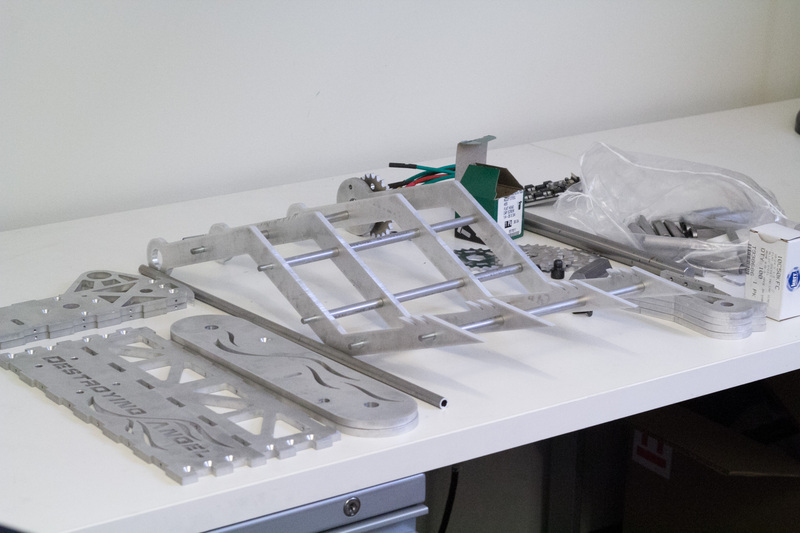 Instead of requiring any sort of spring return, the design of the legs simply eradicates the option of landing on top of them, which is how it could hinder movement. The hard stop for the legs is a simple 3/8″ cap screw threaded into the outer frame. 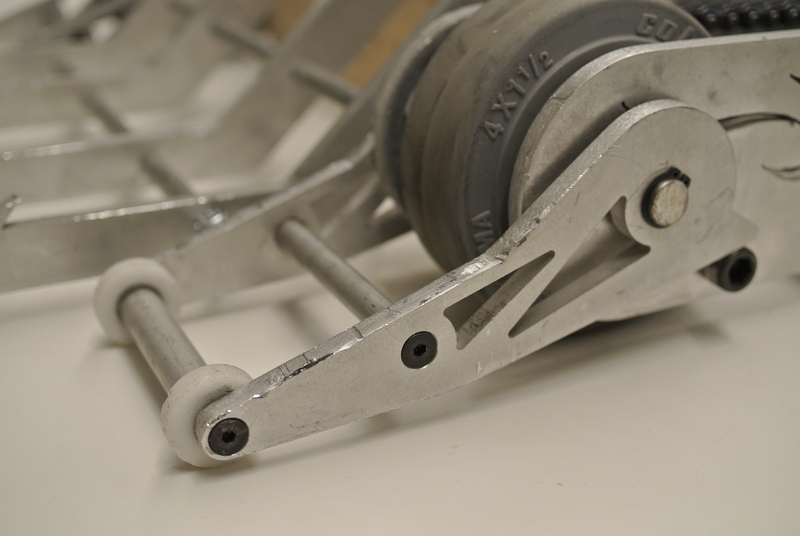 The pivoting leg assembly made of waterjet aluminum, aluminum tubing, and Delrin “wheels”. The entire bot (except for chain. forget that.) 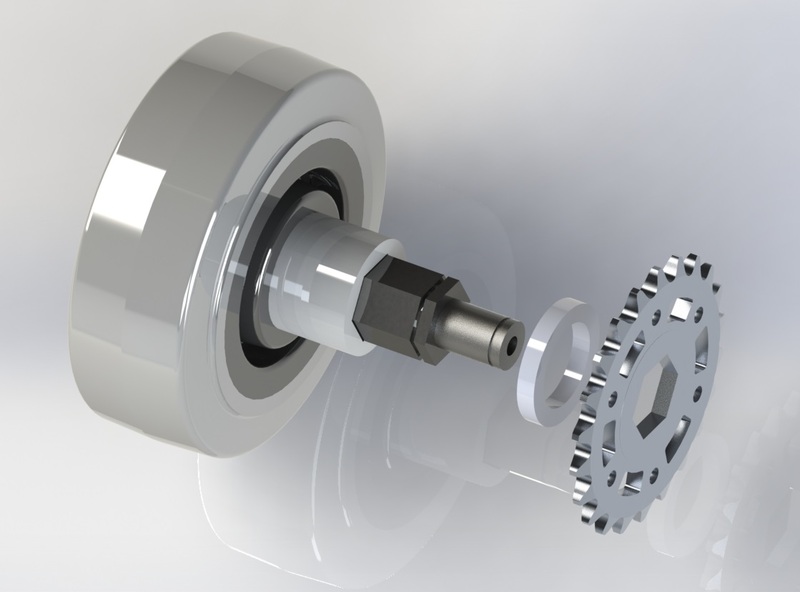 was designed in SolidWorks. Of course, we scrounged up as many pre-made design files as possible to save ourselves a lot of time (many part vendors have CAD files of their products readily available for use). 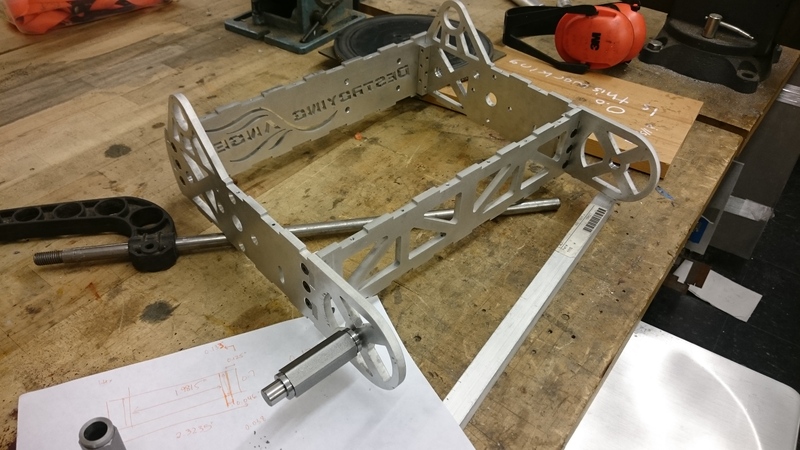 The inner and outer frame, legs, some sprockets and the weapon were all cut on a waterjet machine out of sheet aluminum and then orbital sanded. The disassembled state after orbital-sanding. Photo credit: Lucy Du. Inner frame and the beginnings of a wheel assembly. The very last things to be made for the bot before the trip down South were the top and bottom plates, which were waterjet out of clear Lexan sheets. That and mounting the plug for turning our bot on and off. 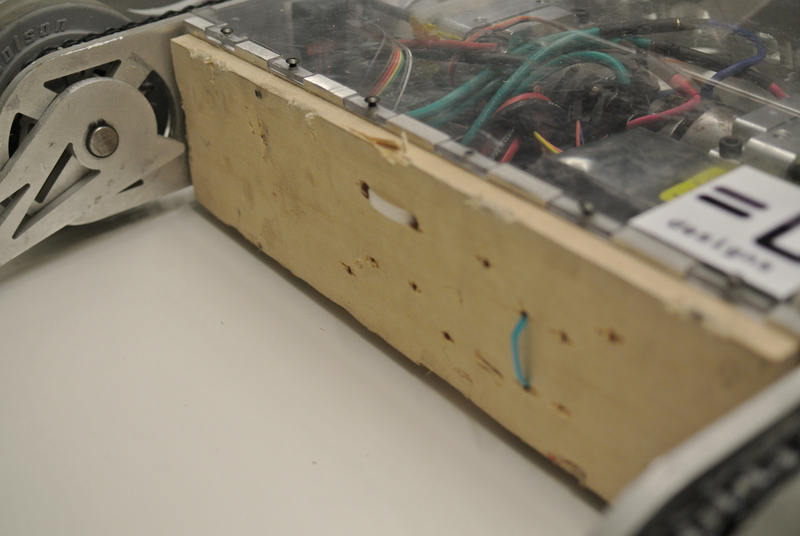 Since the Dean’s connector didn’t have enough surface area to bond to the frame reliably, a small housing was designed that allowed for the connector to be mounted more safely and securely to the frame using Goop adhesive. The Dean’s connector in the ABS printed housing – not exactly the safest place for a key, we admit. Destroying Angel was assembled in the last day or so before we left for Dragoncon, which is an annual Sci-Fi convention in Atlanta, Georgia. While down in Georgia, we discovered that my basement was a pretty good place to practice driving and actuating the bot. Driving around on the dusty concrete floor was much harder than driving on the carpeted arena floor, which was good for us. We were also able to discover and quickly fix a few bugs and mishaps. The first of which was getting finer control (and less trigger-happy) on the weapon- after slamming into the ground several times, we managed to shear the sprocket on the motor in half (Luckily, we’d brought spares. Always bring spares.). It was also immediately apparent during driving practice that the bot wasn’t driving as we had initially expected. As it turns out, drill motors move a lot more efficiently in the forward direction than in reverse, and so with the drive configured as it was, pushing straight forward on the joystick meant that the bot would slowly turn while moving forwards. Of course, that was just another quirk to get used to, as remaking the drive at that point wasn’t an option. 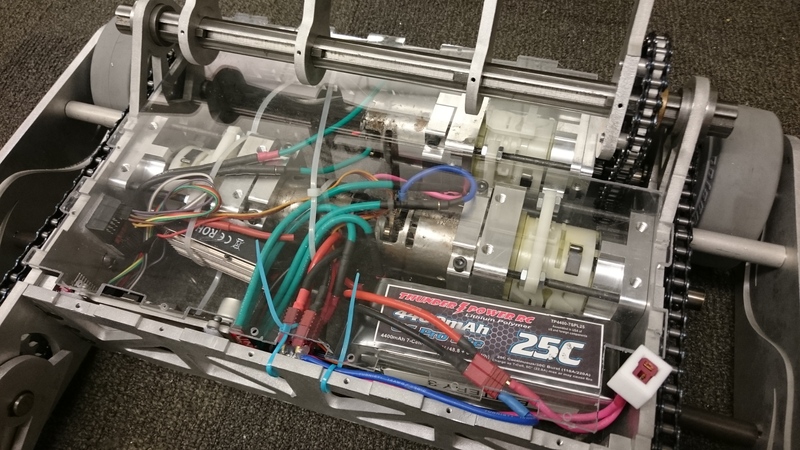 Initially, we’d planned on sticking a plate of Lexan up in the front of the bot to protect the batteries (which are right up against the front) and the other internals. We’d run out of time before the competition, and so our fix was to cut a light piece of wood to the right shape, drill holes to match the frame bars, and zip-tie it to the front. After implementing this, we noticed that the weapon wasn’t dragging on the concrete anymore, but was floating just above it- the wood plank had rather conveniently and inadvertently become a soft-stop for the weapon as well. 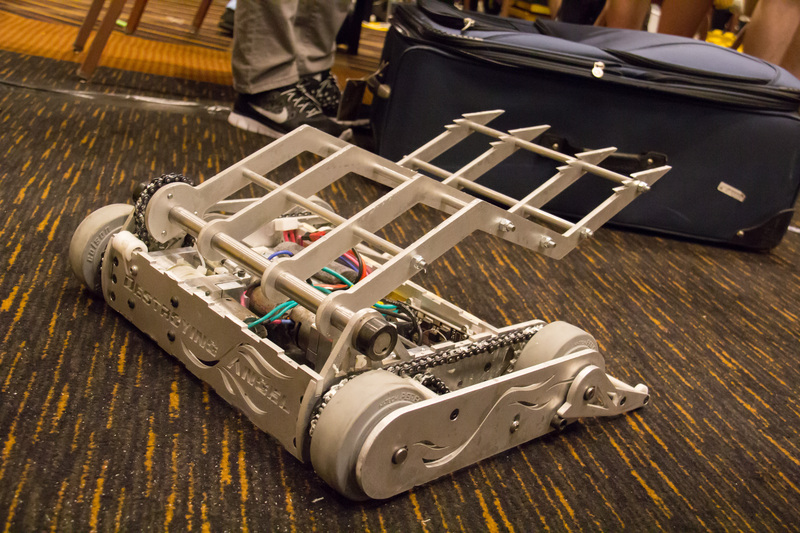 Pictured above: our bot doesn’t know its own strength. Innovative and high-tech internal circuitry protection and unintentional soft stop for the weapon (post Dragoncon). Immediately before the event at Dragoncon, we were still making a few changes. Most significantly, after having slammed the weapon around, we found that the chain had loosened far too much. Since we didn’t have chain tensioners built in, we improvised one out of a piece of Delrin tube. 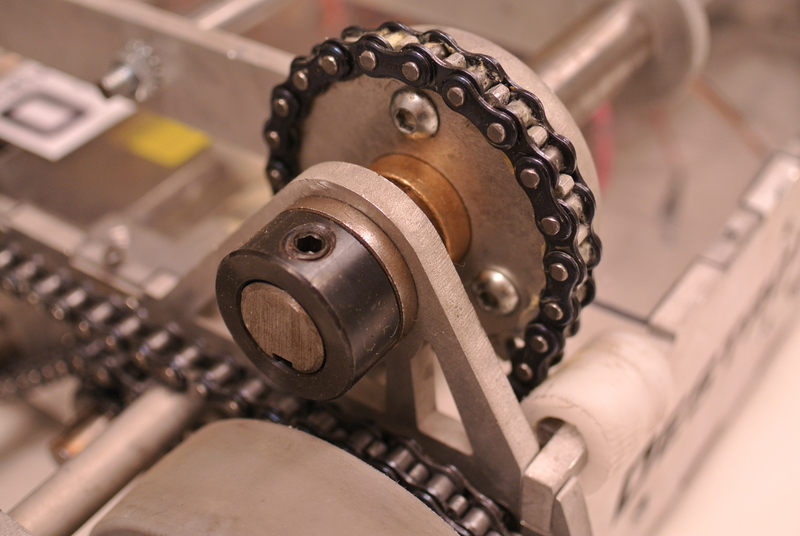 Improvised chain tensioner made of extra Delrin tube, courtesy of the honorary team lathe, Dane Kouttron. Pre-fight photoshoot. Photo credit: Lucy Du. Lucy and I tag-teamed the controls during Dragoncon. I had the easy job of actuating the weapon while Lucy drove the bot. It looked pretty great with the two of us on a single controller. For our first match, we faced off against Styx from Near Chaos Robotics. We lost the first round, tied the second, and ultimately lost the third. We faced off with Charles for our last match and, as expected, he wiped the floor with us (though we did manage to tie in one round). It was in that match, unfortunately, that the weapon stopped working (possible motor or controller issues to be debugged). We were unable to regain movement of our weapon afterwards, but jumped immediately into the rumble for a final run (during which I drove for the fun of it and Charles won without being able to drive). Uberclocker with its creator, the Hatsune Miku-themed cat-maid: Charles Guan. In order to prepare for future events, there are several things that should happen for this bot. For one, much more driving and actuation practice is necessary. Especially when having two drivers on a single controller. It will probably take a fair amount of time to get used to the DeWut forward tendency as well. A soft stop for the weapon in both directions would also be nice to have- right now, the wood plank on the front acts as a soft stop for the front of the bot, but the stop on the back of the robot is, quite unfortunately, the frame itself. Though the wood plank on the front of the bot works well, perhaps something slightly more aesthetically pleasing could be crafted. The chain tensioner for the arm may also be revisited if there is enough time. 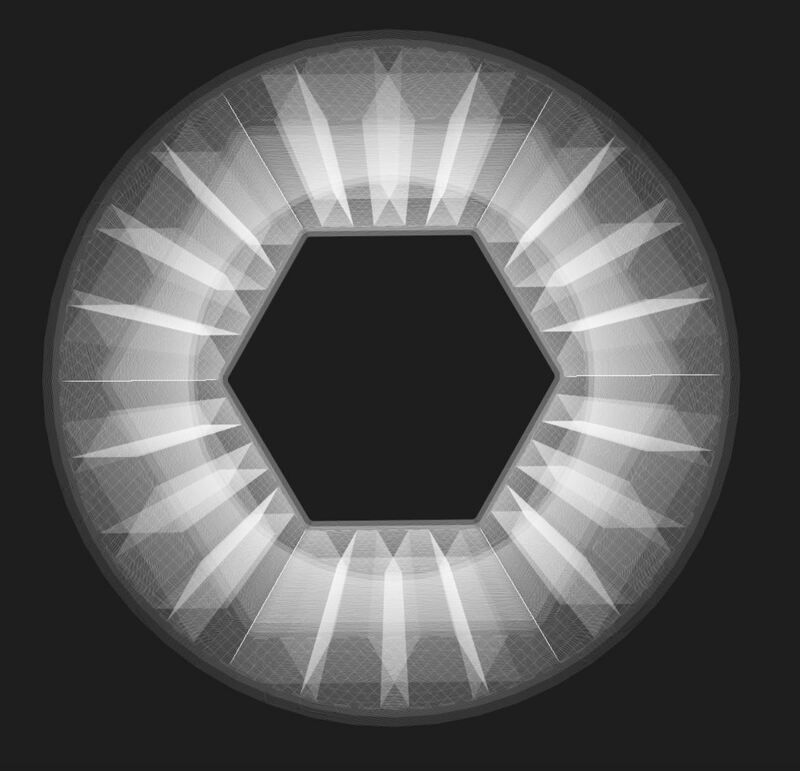 The hexagonal inserts in the Colson wheels must also be replaced with a sturdier material- Charles, who uses the same sort of printed insert, lost drive near the end because of his inserts failing. Overall, we did well and this robot has a lot of potential. We will definitely continue with practicing driving and hopefully enter this bot into the next competition- the NERC competition at the Franklin Institute in Philly. For the moment, Destroying Angel has picked up some volunteer work as a surrogate autonomous go-kart. Repairs, mods, and future events will be detailed in another post. 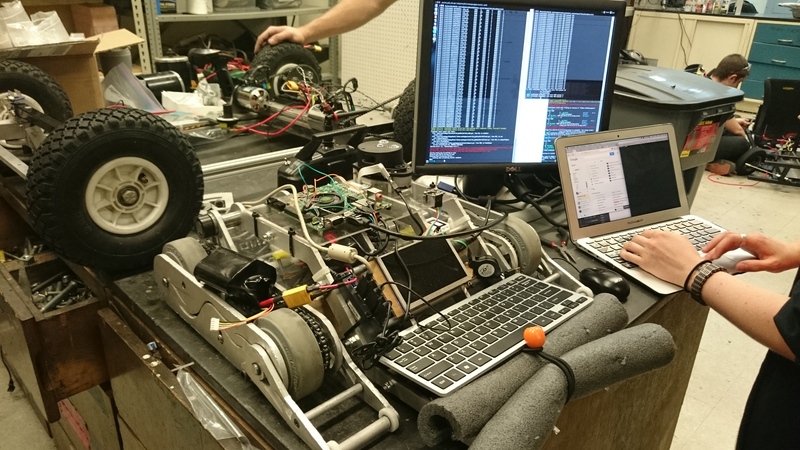 Why use an RC car when you can use a combat robot? It’s like having a pair of scissors running around autonomously.